Want to connect with Dg? NEW PROJECTS, REMODEL ADDITIONS, MAIN PANELS &UPGRADE, FANS PARKING LOT & STORE LIGHTING, ELECTRICAL CONTROL MOTOR. 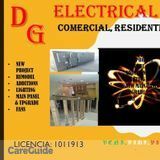 RESIDENCIAL, COMERCIAL AND INDUSTRIAL SERVICES.